Captain Underpants: The First Epic Movie is a 2017 American computer-animated superhero comedy film based on Dav Pilkey's children's novel series of the same name, produced by DreamWorks Animation and distributed by 20th Century Fox. It was directed by David Soren from a screenplay by Nicholas Stoller, and stars the voices of Kevin Hart, Ed Helms, Nick Kroll, Thomas Middleditch, Jordan Peele and Kristen Schaal. 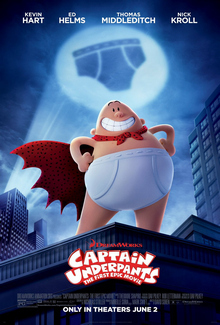 The plot follows two imaginative elementary school pranksters named George Beard and Harold Hutchins (voiced by Kevin Hart and Thomas Middleditch) who hypnotize their mean-spirited principal, Mr. Krupp (voiced by Ed Helms), into thinking he is Captain Underpants, a superhero who fights crime while wearing only underwear and a cape. Captain Underpants premiered on May 21, 2017, at the Regency Village Theater in Los Angeles, and was released in the United States on June 2, 2017, in 3D and 2D. The film received generally positive reviews and grossed $125 million worldwide against a budget of $38 million, making it the lowest-budgeted computer-animated feature of DreamWorks Animation's history. This was the last DreamWorks Animation film to be distributed by 20th Century Fox (rights to the entire DWA library, including this film, are now owned by Universal Pictures, following NBCUniversal's purchase of DWA in 2016). With the film's release in Saudi Arabia paired with The Emoji Movie on January 13, 2018, both became the first films to be given official public screenings in the country in 35 years after the removal of Saudi Arabia's cinema ban. In Piqua, Ohio, George Beard and Harold Hutchins are two fourth-grade friends and next-door neighbors who often bring joy to their school, Jerome Horwitz Elementary School, by excessively pranking the cruel teachers, especially the mean Principal Benjamin "Benny" Krupp, which puts them at odds with him. The duo also create comic books about a superhero named Captain Underpants, a character who has superpowers and wears underwear and a cape. They sell these to their schoolmates through a comic company called Treehouse Comix Inc, housed in their treehouse. George and Harold's pranks come to an apparent end after they tamper with a toilet invention, the Turbo Toilet 2000, made by the school's local snitch, intellectual Melvin Sneedly. This causes Mr. Krupp to decide to separate the boys and annihilate their friendship. To prevent this, George hypnotizes Mr. Krupp with a 3D Hypno Ring he received out of a cereal box; the boys see that Mr. Krupp bears a resemblance to Captain Underpants without his toupee and command him to be Captain Underpants. The boys soon learn the severity of their acts when Captain Underpants begins causing some problems around Piqua and take him to their tree-house. There they discover that they can turn Captain Underpants back into Mr. Krupp by splashing water on him and can turn him back into Captain Underpants by snapping their fingers. Believing that Mr. Krupp will continue with trying to separate them, they decide to settle with Captain Underpants but insist that he be dressed up as Mr. Krupp under the pretense of a 'secret identity' to which Captain Underpants agrees. His sudden personality change even manages to attract the attention and affection of the school's shy lunch lady, Edith. Just when George and Harold believe that their troubles have ended, Jerome Horwitz Elementary School is visited by an odd, German-accented scientist named Professor Pippy P. Poopypants, or as he calls himself Professor P. Captain Underpants (disguised as Mr. Krupp) hires him to be a new teacher, but George and Harold are suspicious of him due to his short-tempered and violent behavior. As it turns out, Poopypants is seeking to get rid of laughter altogether due to the fact that people have made fun of his name for years. With Captain Underpants as principal, the school is a more lively place, with a funfair being set up in the yard. However, a rainstorm occurs and Captain Underpants turns back into Mr. Krupp, who finally finishes the paperwork to put George and Harold into separate classes. Meanwhile Professor P. recruits Melvin into his plan, as his brain is incapable of having fun. Soon, Professor Poopypants tries to take over the town with a giant version the Turbo Toilet 2000, fueled by the school cafeteria's rotten leftovers left out by Edith– and uses Melvin's brain to turn the children into glum, humorless zombies. Captain Underpants tries to stop the villain, but due to having no actual superpowers, is effortlessly defeated and thrown into the toilet. George and Harold are captured and nearly turned into zombies, but are able to escape when their laughter damages the Turbo Toilet 2000's computer. Upon consuming the mutated leftovers, Captain Underpants acquires superpowers and, with George and Harold's help, defeats and shrinks Poopypants, though he escapes on a bee shortly thereafter. Knowing that they cannot control Captain Underpants, George and Harold destroy the Hypno Ring to permanently change him back into Mr. Krupp. Feeling that Mr. Krupp would be nicer if he had friends, the boys set him and lovesick Edith up on a date, thus making Mr. Krupp have a change of heart, returns the comics he took away from George and Harold, and even admits their comics are funny. However, the toxic waste from the Turbo Toilet 2000 transforms all the toilets into an army of Talking Toilets which attack the restaurant at which Mr. Krupp and Edith are dining. Upon snapping his fingers (accidentally), Mr. Krupp once again becomes Captain Underpants, carrying George and Harold away to help him fight them, much to Edith's surprise and admiration. In a mid-credits scene, George and Harold realize that the secretary, who put her on the phone before by faking for a contest of $2 billion, has been on the phone for the entire film, so they shut off the call, make the secretary angry, and make a new comic based on her reaction. Kevin Hart as George Beard, a fourth-grade student. He is Harold's best friend and writes stories for the comics he and Harold make. Thomas Middleditch as Harold Hutchins, a fourth-grade student. He is George's best friend and illustrates the comics he and George make. Ed Helms as Principal Benjamin Krupp/Captain Underpants, the mean-spirited principal of Jerome Horwitz Elementary School, who is hypnotized into becoming the superhero created by George and Harold, to stop him from putting them in separate classes. Nick Kroll as Professor Pee-Pee Diarrheastein Poopypants Esq., a ruthless and cheerful scientist and Captain Underpants' arch-nemesis angered after being constantly made fun of and not taken seriously for his name, who decides to take over the world to get rid of all laughter. Jordan Peele as Melvin Sneedly, George and Harold's nerdy nemesis, a child prodigy inventor; he becomes Prof. Poopypants' unwitting sidekick. Kristen Schaal as Edith, the shy school lunch lady and the love interest of Mr. Krupp who was created exclusively for this film. Dee Dee Rescher as Ms. Tara Ribble, the 4th-grade teacher (and George's new teacher when Mr. Krupp separates the boys). Brian Posehn as Mr. Rected, the guidance counselor (and Harold's new teacher when Mr. Krupp separates the boys). Mel Rodriguez as Mr. Morty Fyde, the science teacher who gets fired by Mr. Krupp and is replaced by Professor Poopypants. David Soren as Tommy, a boy who is seen frequently throughout the movie climbing into his own locker and shutting the locker door behind him. Susan Fitzker as Mrs. Dayken, George and Harold's kindergarten teacher and unintentionally made them laugh by mentioning Uranus. DreamWorks' interest in the film rights to the Captain Underpants series dates back to when the first installment was published in 1997, but creator Dav Pilkey did not want to sell them. Early pitches for an adaptation included video games, animated and live-action films, an animated series, and a live-action series. To persuade him, DreamWorks gave Pilkey a tour around the studio with everyone wearing underpants over their actual pants, which made him laugh. In October 2011, his representatives indicated Pilkey was ready, and DreamWorks Animation won the rights in an auction. In October 2013, Rob Letterman was announced as director and Nicholas Stoller as scriptwriter. The two had previously worked together on the film Gulliver's Travels. In January 2014, the cast was announced. Ed Helms joined as Mr. Krupp a.k.a. Captain Underpants, Kevin Hart as George Beard, Thomas Middleditch as Harold Hutchins, Nick Kroll as the "insidious villain" Professor Poopypants, and Jordan Peele as George and Harold's "nerdy nemesis" Melvin Sneedly. ... we actually looked at a lot of John Hughes movies for inspiration, like Ferris Bueller's Day Off and Weird Science. John Hughes had this great knack for making comedies like this. Both of those movies have great friendships at the center of them. He seemed to be able to tap into the voice of a generation. They're very funny, all of his movies, but they are also poignant and they actually have meaningful things to say, which I think is why they have stood the test of time. So there's timelessness to his work that we were attempting to go for with this. Although it is a CG-animated feature, the film includes scenes that are traditionally animated, flash animated, a short cutout animation segment, and a sock puppet sequence created by Screen Novelties. "Weird Al" Yankovic wrote and performed the theme song for the film, which was featured in a lyric video. Andy Grammer wrote another original song for the film, titled "A Friend Like You". The film also features music from Adam Lambert, Cold War Kids member Nathan Willett, and Lil Yachty. An 11-track soundtrack album was released digitally on June 2, 2017, by Virgin Records and Deep Well Records. The film score was composed by Theodore Shapiro. A soundtrack for the score of the film was released on June 9. It features 24 pieces of music, and an exclusive digital booklet on iTunes. Three of the scores are also available on the soundtrack (those being "Comic Book Opening", "Saving the Day", and "The Prank for Good"). All tracks written by Theodore Shapiro. Captain Underpants: The First Epic Movie was previously scheduled to be released on March 10, 2017, but in September 2015, The Boss Baby took over its date. The film was then moved to June 2, 2017, and was released by 20th Century Fox. Other territories such as Europe and Asia received the film between July and October 2017 and the movie came on DVD and Blu-ray on September 12, 2017 and it premiered on May 21, 2017 at the Regency Village Theater in Los Angeles. The film was chosen along with The Emoji Movie to inaugurate the removal of Saudi Arabia's cinema ban through a double feature screening on January 13, 2018 organized by Cinema 70. Both are the first two movies to be given an official public screening in the country in 35 years. Captain Underpants: The First Epic Movie grossed $73.9 million in the United States and Canada and $51.6 million in other territories, for a worldwide gross of $125.5 million, against a production budget of $38 million. In North America, the film was released alongside Wonder Woman, and was projected to gross around $20 million from 3,434 theaters in its opening weekend. It made $8 million on its first day and $23.9 million in its opening weekend, finishing second at the box office, behind Wonder Woman ($103.3 million). The film grossed $12.2 million in its second weekend, $7.2 million in its third and $4.3 million in its fourth. In Norway, the movie went to number-one at its box office for a week and made $1.8 million in total, from its run. On Rotten Tomatoes, the film has an approval rating of 88% based on 128 reviews and an average rating of 6.86/10. The site's critical consensus reads, "With a tidy plot, clean animation, and humor that fits its source material snugly, Captain Underpants: The First Epic Movie is entertainment that won't drive a wedge between family members." On Metacritic, the film has a score of 69 out of 100 based on 25 critics, indicating "generally favorable reviews". Audiences polled by CinemaScore gave the film an average grade of "B+" on an A+ to F scale. Matt Zoller Seitz of RogerEbert.com gave the film three-and-a-half out of four stars. Although Seitz pointed out that the film is hampered by "a rushed, jumbled quality" and has "tiresome" features that he says are common to DreamWorks, such as "frenetic action scenes ... and the use of workhorse pop songs", he emphasized that "[t]hey've approached this compendium of elemental slapstick and unabashed childishness with the reverence that the Coen brothers brought to No Country for Old Men." He further added that the inclusion of the flip book interludes are the film's best parts, especially in having the pages accidentally be torn similar to the real books, stating that "[i]t's not often that a movie puts a spotlight on a mundane ritual in your own life that you never realized was profound and says, 'You probably forgot about this, but I want you to remember it and savor it, because it meant something.'" Captain Underpants: The First Epic Movie was released on Digital HD on August 29, 2017, and on DVD, Blu-ray and Ultra HD Blu-ray on September 12, 2017, by 20th Century Fox Home Entertainment, and has been released by Universal Pictures Home Entertainment in certain territories. Following DreamWorks Animation's end of partnership with 20th Century Fox, this was the last DreamWorks Animation film to be re-released on home media by 20th Century Fox Home Entertainment. On December 12, 2017, Netflix and DreamWorks Animation Television announced that there would be an animated series to follow-up the film, entitled The Epic Tales of Captain Underpants. It premiered on the streaming service on July 13, 2018 and is executive-produced by Peter Hastings. ^ a b Rechtshaffen, Michael (June 1, 2017). "'Captain Underpants: The First Epic Movie': Film Review". The Hollywood Reporter. Retrieved November 11, 2017. ^ "Captain Underpants: The First Epic Movie". AMC Theatres. Retrieved May 21, 2017. ^ "Captain Underpants The First Epic Movie (2017)". British Film Institute. Retrieved March 26, 2018. ^ McClintock, Pamela (June 1, 2017). "Box Office Preview: 'Wonder Woman' Readies for $95M-Plus U.S. Debut". The Hollywood Reporter. ^ a b "Captain Underpants: The First Epic Movie (2017)". Box Office Mojo. IMDb.com, Inc. Retrieved May 14, 2018. ^ Amidi, Amid (June 2, 2017). "'Captain Underpants' Could Dramatically Alter The U.S. Feature Animation Industry". Cartoon Brew. Cartoon Brew, LLC. Retrieved June 3, 2017. ^ a b c d e f DreamWorks Animation (January 21, 2014). "Captain Underpants Saves The Day By Recruiting Top Comedy Talent To Voice New DreamWorks Animation Film" (Press release). PR Newswire. Retrieved January 22, 2014. ^ a b Snetiker, Marc (June 28, 2016). "Captain Underpants movie recruits Kristen Schaal". Entertainment Weekly. Retrieved December 26, 2016. ^ a b c Josh Rottenberg (June 1, 2017). "Why Captain Underpants author Dav Pilkey played hard to get with Hollywood". The Los Angeles Times. Retrieved June 4, 2017. ^ Mike Flemming, Jr (October 19, 2011). "DreamWorks Animation Wins Auction For 'Captain Underpants' Feature Film Rights". Deadline. Retrieved May 12, 2017. ^ Kit, Borys (October 25, 2013). "Rob Letterman to Direct 'Captain Underpants' for DWA (Exclusive)". The Hollywood Reporter. Retrieved October 26, 2013. ^ Trumbore, Dave (June 12, 2014). "DreamWorks Animation Release Dates Include Madagascar 4". Collider.com. Retrieved June 12, 2014. ^ Lieberman, David (January 22, 2015). "DreamWorks Animation Restructuring To Cut 500 Jobs With $290M Charge". Deadline Hollywood. Retrieved January 25, 2015. ^ Graser, Marc (January 22, 2015). "Jeffrey Katzenberg on DWA's Cutbacks: '3 Films a Year Was Too Ambitious". Variety. Retrieved September 20, 2015. "Trolls," set for a 2016 release, will be the first film to be made with the $120 million budget. ^ a b Fleming Jr., Mike (February 26, 2015). "Rob Letterman Doffs 'Captain Underpants'; 'Turbo's David Soren Being Fitted For DWA Pic". Deadline Hollywood. Retrieved March 5, 2015. ^ Sara Michelle Fetters (June 16, 2017). ""CAPTAIN UNDERPANTS: THE FIRST EPIC ADVENTURE" – Interview with DAVID SOREN". Retrieved March 22, 2018. ^ a b c Tom, Lauren (May 12, 2017). "Captain Underpants' Movie Scores Epic Soundtrack With 'Weird Al', Lil Yachty & More". Billboard. Retrieved May 20, 2017. ^ "'Captain Underpants: The First Epic Movie' Soundtrack Details". Film Music Reporter. May 11, 2017. Retrieved May 20, 2017. ^ McClintock, Pamela (September 18, 2015). "Hugh Jackman's 'Greatest Showman on Earth' Pushed a Year to Christmas 2017". The Hollywood Reporter. Retrieved September 19, 2015. ^ "Theatrical Movie Schedule Changes and Additions". Box Office Mojo. IMDb.com, Inc. March 27, 2016. Retrieved March 27, 2016. ^ Coggan, Devan (December 24, 2016). "Captain Underpants leaps to the big screen in exclusive first look". Entertainment Weekly. Time Inc. Retrieved December 25, 2016. ^ "Kevin Hart, Kristen Schaal attend 'Captain Underpants' premiere in Los Angeles". United Press International. May 22, 2017. Retrieved May 22, 2017. ^ Milligan, Mercedes (January 15, 2018). "'Emoji Movie,' 'Captain Underpants' Break Saudi Arabia's 35-Year Cinema Fast". Animation Magazine. Jean Thoren. Retrieved February 6, 2018. ^ D'Alessandro, Anthony (May 30, 2017). "'Wonder Woman': All The World Is Waiting For You As Warner Bros./DC Pic Eyes $175M+ Global Opening". Deadline Hollywood. Penske Business Media, LLC. ^ a b D'Alessandro, Anthony (June 4, 2017). "'Wonder Woman' Breaks Glass Ceiling For Female Directors & Stomps On 'Iron Man' With $100.5M Debut". Deadline Hollywood. ^ Anderson, Tre'vell (June 4, 2017). "'Wonder Woman' lassos $100.5 million at domestic box office, 'Captain Underpants' overperforms". Los Angeles Times. Tronc. ^ D'Alessandro, Anthony (June 25, 2017). "Why 'Transformers' Is Screaming For Reboot After $69M Start; 'Wonder Woman' & 'Cars 3' Fight Over 2nd Place". Deadline Hollywood. Penske Business Media, LLC. ^ "Captain Underpants: The First Epic Movie, Norway Weekend Box Office 2017". Box Office Mojo. ^ "Captain Underpants: The First Epic Movie (2017)". Rotten Tomatoes. Fandango. Retrieved November 9, 2018. ^ "Captain Underpants: The First Epic Movie reviews". Metacritic. CBS Interactive Inc. Retrieved August 12, 2017. ^ Seitz, Matt Zoller (June 2, 2017). "Captain Underpants: The First Epic Movie Movie Review". RogerEbert.com. Ebert Digital LLC. Retrieved June 3, 2017. ^ "Captain Underpants: The First Epic Movie DVD Release Date". DVDs Release Dates. Retrieved 24 July 2017. ^ "BEST-REVIEWED ANIMATED MOVIES 2017". Rotten Tomatoes. January 3, 2018. Retrieved January 3, 2018. ^ "IFMCA Award Nominations 2017". International Film Music Critics Association. February 8, 2018. ^ "IFMCA Award Winners 2017". International Film Music Critics Association. February 22, 2018. ^ Pond, Steve (February 26, 2018). "Nickelodeon's Kids' Choice Awards 2018". E! Online. Retrieved February 26, 2018. ^ "Los Angeles Online Film Critics Society Film Nominations". laofcs.org. LA Online Film Critics Society. Retrieved December 14, 2017. ^ Evangelista, Chris (December 4, 2017). "2017 Los Angeles Online Film Critics Society Nominations". Slash Film. Retrieved December 14, 2017. ^ Maglio, Tony (12 December 2017). "'She-Ra' Scores Netflix Reboot Through DreamWorks Animation". TheWrap. ^ Milligan, Mercedes (June 20, 2018). "DreamWorks 'Epic Tales of Captain Underpants' Opener Undressed". Animation Magazine.